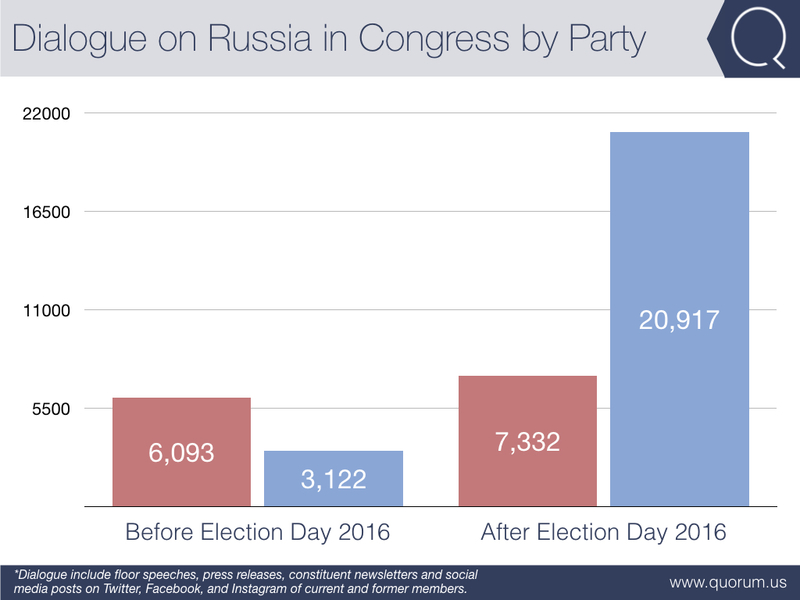 On July 16, 2018, the day of the Helsinki Summit, Congress mentioned Russia and Vladimir Putin more than 1100 times, far and away the most statements on Russia in a single day. That day, Democrats mentioned Russia and its president three times as much as their Republican counterparts. Just a few years ago, Republicans dominated congressional dialogue on Russia. It wasn’t so long ago, that Republicans were the rhetorical Russia hawks in Congress. 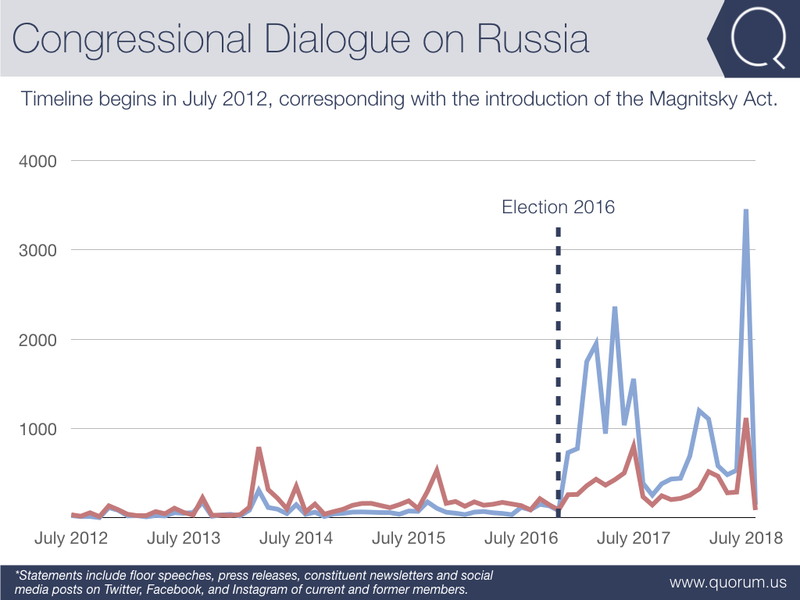 In fact, Democrats’ dialogue on Russia only surpassed Republicans’ after the 2016 election, five months after news of Russian meddling first broke. Before the 2016 election, Republicans had twice as many mentions as their colleagues across the aisle. Flash forward to today and three quarters of all mentions of Russia come from Democrats. 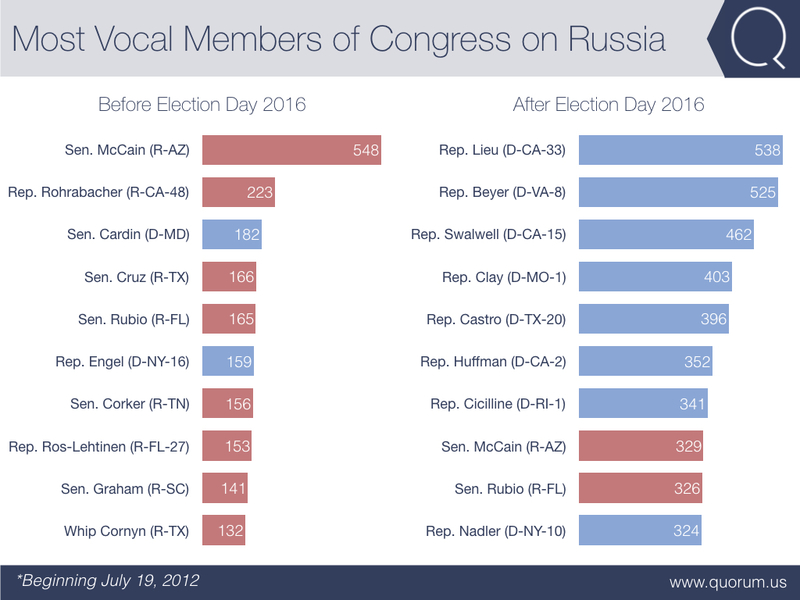 Until Election Day 2016, eight of the top ten most vocal members on Russia were Republicans. Since then, this statistic has flipped, with Democrats accounting for eight of the top ten members. Representatives Ted Lieu (D-CA-33), Don Beyer (D-VA-8), and Eric Swalwell (D-CA-15) top the list. Republican Senators McCain (R-AZ) and Rubio (R-FL) have remained on the list. Democratic rhetoric on Russia since the election has focused on President Trump. 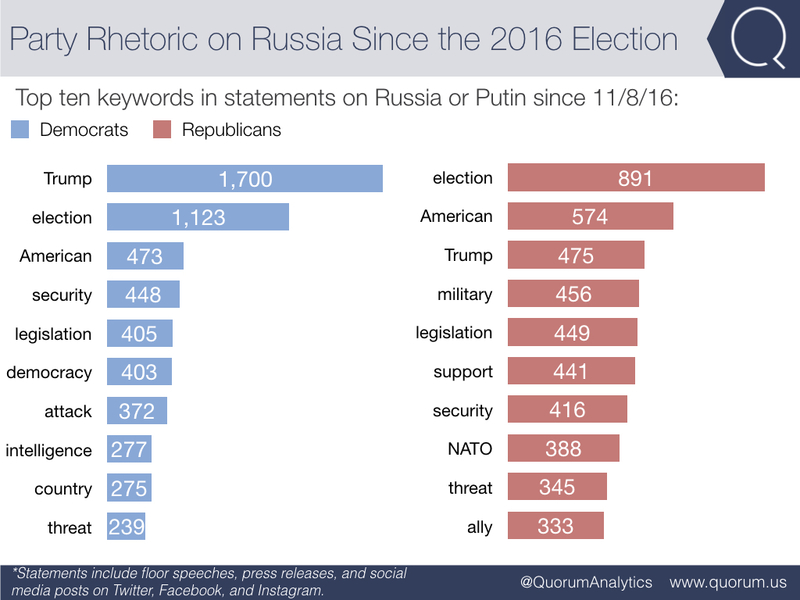 The top keyword Democrats use in reference to Russia is Trump, with 1700 mentions compared to a mere 475 Republican mentions of the President. Democrats also mention democracy more often. On the other hand, Republicans emphasize NATO, military, and ally far more than Democrats do.